There are more than 50 Million people in the US wearing contact lenses every day. Optix-now is your independent source for learning more about contact lens products, differences in materials, technologies & wearing schedules, manufacturer rebates, free trials and more. We want to give you the information and tools you need, so you can have an informed discussion with your eye care practitioner. Are you looking for an eye care practitioner? Try our brand-new Practitioner Finder. There is nothing mysterious about wearing contact lenses. It simply changed the way I see and the way I look. I had no idea multi-focal contacts would work that well. But I was convinced after my first set of trial lenses. Almost everyone can wear contact lenses. There are lenses that help compensate for poor eyesight. There are lenses to change or enhance the color of your eyes. There are lenses for age-related vision correction, a condition called presbyopia. And there are lenses for people with astigmatism, a common imperfection in the curvature of the cornea. Just last week a good friend told me, that the cost of wearing contact lenses can be really high. I am 48 and need reading glasses to read a menu in a restaurant. There are no contacts for my age group. Do I need to see an eye care practitioner before getting into contact lenses? Aren't contact lenses very expensive? No. You can wear contact lenses for as little as 30 cents per day. Ask your eye care practitioner for weekly or monthly replaceable lenses. And even daily replaceable lenses you can get for less than a dollar per day. Are contact lenses only for younger people? No. In fact, the market for age-related vision correction using multi-focal contact lenses is the fastest growing product category in the contact lens market. More and more patients with presbyopia are switching from progressive glasses to multi-focal lenses or use both. Explore multi-focal lenses now. Yes. Only an eye care practitioner (ECP) can determine which lenses you need and which brands are the right ones to choose from. A lens fitting process will ensure that the technical parameters of the lens (such as prescription, base curve, diameter etc.) 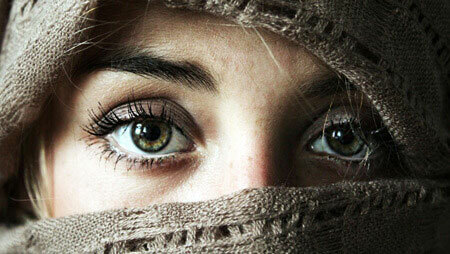 are optimized to the requirements of your eyes. With a valid prescription you can buy your lenses from your ECP, an optical store (e.g. local, Walmart, SamsClub, CostCo, PearleVision) or from a reputable online store. Contact lenses can be broken down into three major vision correction types and two major replacement types. Besides standard lenses, there are contacts for presbyopia or astigmatism as well as color lenses. And you can choose between daily disposable lenses and weekly/monthly replaceable lenses. A lot of choices? Yes. And, there is certainly a lens for your correction needs and your lifestyle. Here is a small selection of the best daily disposable contact lenses. How much does it cost to wear contact lenses? Is there a difference between wearing monthly or weekly replaceable lenses and daily disposable contact lenses? And are there any differences between the major brand manufacturers? We've put together a table showing the daily cost per eye for the most popular lenses on the market. This comparison of lenses for myopia/hyperopia is shedding some light on the true cost. For lens wearers with astigmatism or presbyopia, we also put together a cost comparison of lenses for astigmatism as well as a comparison of multifocal lenses. Patients with presbyopia have now access to another multifocal contact lens from Alcon Inc.. Air Optix plus HydraGlyde Multifocal is the latest contact lens featuring HydraGlyde and SmartShield technology. HydraGlyde, a unique surface moisture technology utilizing a PVP/PEG-based wetting agent, was originally rolled out in 2016 with the non-presbyopic version, Air Optix plus HydraGlyde. In combination with the SmartShield Technology, lens wearers will benefit from the long lasting comfort and enhanced lipid deposit resistance throughout the day. Starting in October 2018, Air Optix plus HydraGlyde Multifocal will be rolled out to eye care practitioners nationwide and internationally. The official press release from Alcon can be found on Alcon's website. 2019 is another exciting year for the contact lens industry, for patients and for eye care professionals around the globe. It marks the first time a contact lens will offer auto-light-adjustment capabilities. Hard to imagine, but yes, these lenses will automatically adapt to changing lighting conditions. This has been available for a long time for glasses, but not for contact lenses, and ACUVUE OASYS® with Transitions® is first of its kind. Johnson & Johnson Vision received FDA pre-market approval for ACUVUE OASYS® with Transitions® on April 10, 2018. 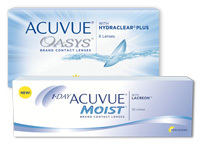 With ACUVUE OASYS® and 1-DAY ACUVUE® MOIST we are comparing the mono-vision contact lenses of the two main product families from Johnson & Johnson Vision Care, Inc.
Johnson and Johnson Vision Care is one of, if not THE market leader in the contact lens industry and the ACUVUE brand is well known and highly respected by millions of patients around the globe. 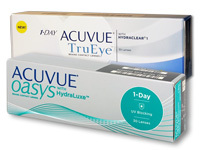 Like 1-DAY ACUVUE TruEye®, Johnson & Johnson Vision Care's ACUVUE OASYS® 1-DAY is a high-performance silicone hydrogel contact lens. They are both made with a water-loving, hydrophilic material that has the ability to absorb water while the silicone hydrogel base material ensures a high level of oxygen transmissibility. This combination makes the lenses soft and comfortable so that the eyes can stay fresh. Introduced in 2009, 1-DAY ACUVUE TruEye® is using Narafilcon A, while ACUVUE OASYS® 1-DAY which was introduced in 2016, uses Senofilcon A, a material also found in the time-tested ACUVUE OASYS® product family. Both lenses feature Class-1 UVA and UVB blocking. Over the last few years, daily replaceable contact lenses have continuously increased their share in a fast-growing contact lens market. This isn't a surprise, as the advantages of wearing daily contact lenses are quite obvious. They don't require any cleaning routine as you just discard them at the end of the day. You can always carry a few extra boxes with you when you are on-the-go or while traveling. You don't have to worry about the handling as you just put them in once and start with a fresh pair every day. And with a fresh pair you reduce the risk of an eye infection. Every major contact lens manufacturer is now offering daily replaceable lenses for all types of vision corrections and most of them carry two or even three daily lens families in their portfolio. So which daily disposable contact lenses are the best? 2018 was another exciting year for the industry with new product introductions, various company acquisitions and improved/new online experiences for all contact lens patients around the world. We believe this innovation trend will accelerate even more in 2019, and so we are coming up with a list of exciting predictions what we believe will stir up the industry. Ready to explore more? Make an appointment with your eye care practitioner or learn more about the various exciting lens technologies and lens types that are available for your vision correction needs. The more you know the better. So you can have an informed discussion and make a decision that's right for you. The most convenient way is to go with daily disposable lenses. You insert them in the morning and toss them in the evening. No cleaning, no storing and a fresh pair every day. And if you are more budget conscious, choose weekly or monthly replaceable lenses. After all, the lens cleaning routine is not that complicated. Every eye is different. Make an appointment with an Eye Care Practitioner. They are the experts and only they can determine the accurate prescription parameters and provide you with the right alternatives. Ask for a free trial - most manufacturers offer free trial lenses. That way you can try out different lens options, and find out which lens works best for you.